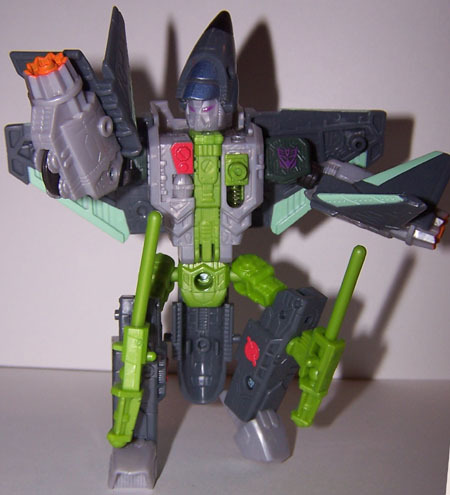 "I fight, I prevail, I conquer"
Bio: Thrust acts as the Decepticons' second-incommand, but the underhanded villain's thinly disguised egotism drives him to be second to none. 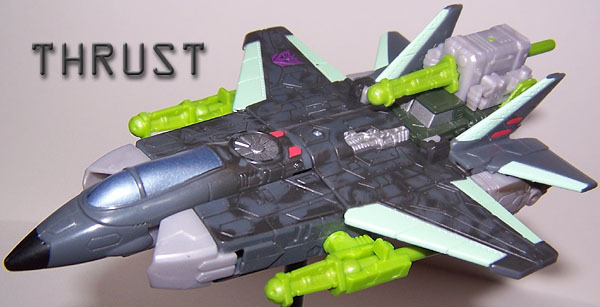 With a characteristic drawl, Thrust manages to con most beings into trusting him, based on his overwhelming tactical skills, battlefield experience, and charm. 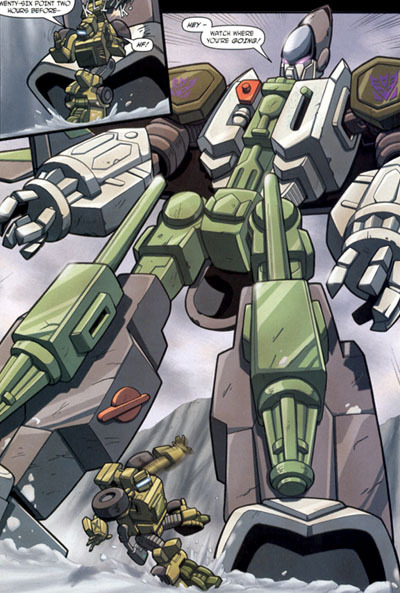 These skills helped the veteran warrior quickly surpass others in the Decepticon hierarchy, thus ensuring that he made numerous enemies as he ascended the ranks. 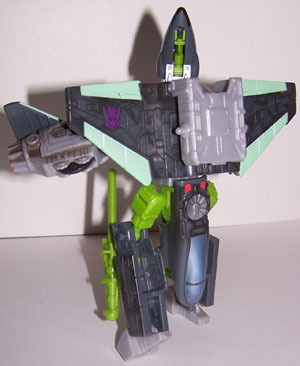 His most notorious rivals are Starscream, who seeks a leadership position for himself, and Demolishor, who craves the chance to be Megatron's favorite. 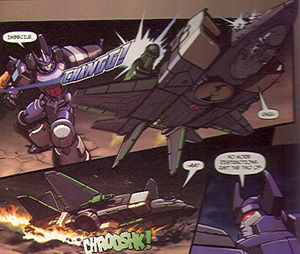 Thrust doesn't care, gladly employing his manipulative skills to jockey even his bitterest enemies into doing his bidding. 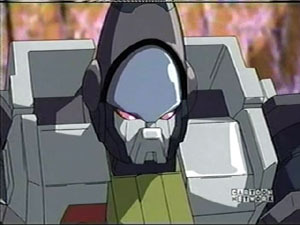 another cartoon pic, in bot mode just before his untimely demise! 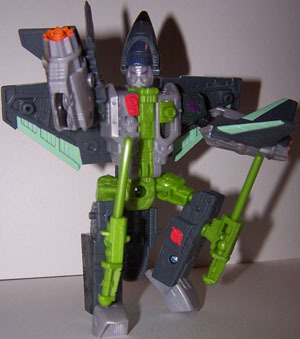 Weapons and Abilities: Subject has enviable strength and Intelligence, and enough speed to match even Starscream. 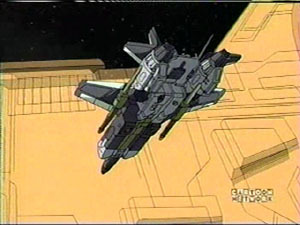 His VTOL (Vertical Take Off and Landing) jet mode is extremely maneuverable in combat, lending credence to the rumors that Subject has never been defeated in battie. 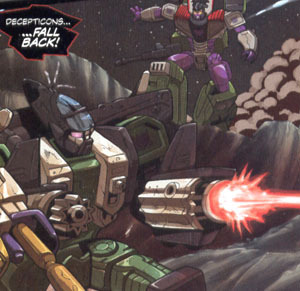 Aside from his stealth capabilities, Subject's most useful gift is his vast knowledge of strategies and tactics. Weaknesses: Subject's skills at manipulation are considerable, but he too can be outsmarted and taken advantage of by a sly foe or ally. He dreams of great power and reward, but doesn't consider the eventual consequences of his ill-conceived alliances and betrayals. 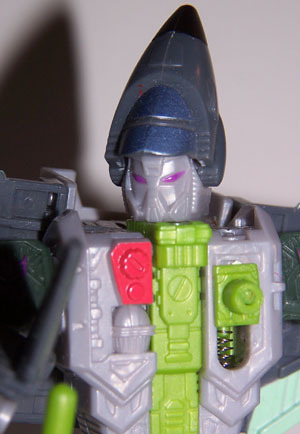 Other Appearances: The first character in Transformers named Thrust debuted in 1985 and was a re-tooled version of the original 1984 jets Starscream, Skywarp... Interestingly, the first version of Thrust also had the nose-cone above his face and head. 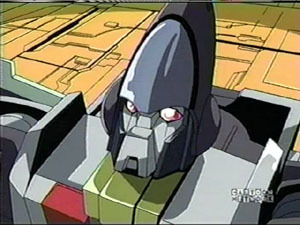 Considering my way of thinking of Armada as taking place after the events of the G1 series, it is possible (tho a bit of a stretch) to think that the bruting not-so-intelligent G1 Thrust could've had an intelligence upgrade and become the cunning military strategist Thrust of TF Armada. 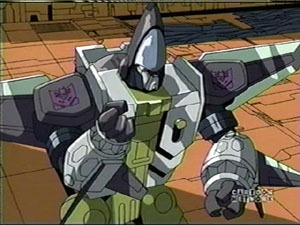 There was also the infamous Thrust character of Beast Machines, debuted in 2000. 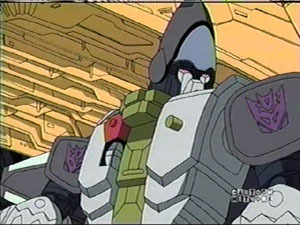 As well as the Thrust of the Japanese Beast Wars 2 line. 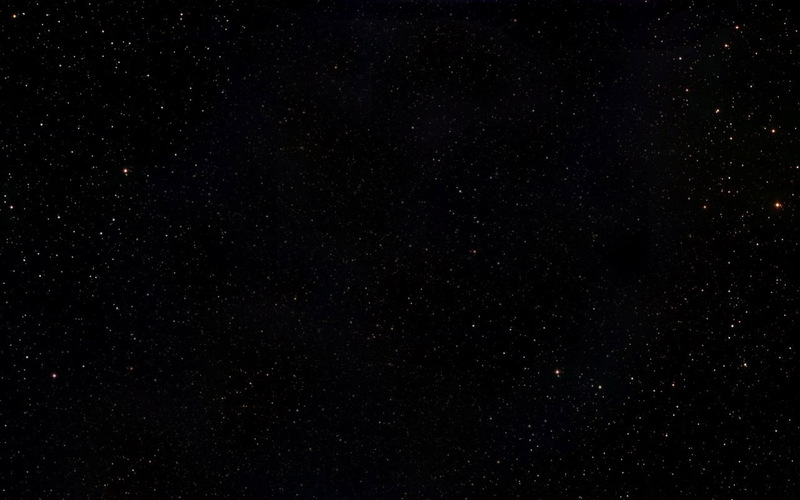 (sorry, no character page yet). 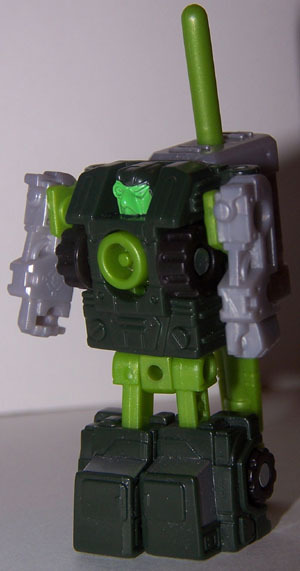 "The chosen exist to lead"
Bio: Selected by Thrust to be his personal Mini-Con, Inferno has grown into the role of aiding his Decepticon partner. 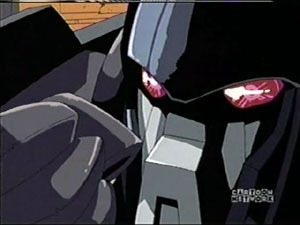 Inferno has become ever more enamored with the feeling of power that comes from being partnered with the respected veteran Decepticon, which has made him take on some of Thrust's arrogant characteristics. 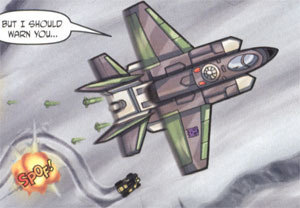 Swaggering among the other Mini-Cons and' even Decepticons with a cocky attitude, Inferno sometimes hinders Thrust's schemes by making them too many enemies, too fast. 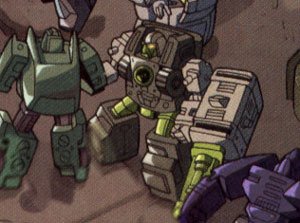 Despite the liability represented by Inferno's boasting, Thrust still values his partnership with the capable and formidable Mini-Con. 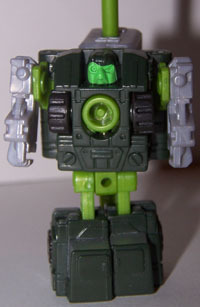 Weapons and Abilities: Although small, Subject is quite powerful in both robot and tank mode. 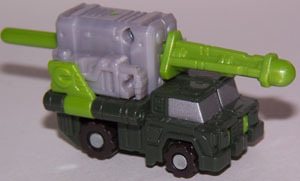 His vehicle mode can launch high-explosive shells up to 7 miles away with pinpoint accuracy. 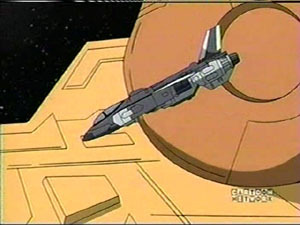 Subject also possesses limited cloaking capabilities, which he can pass on to a larger Transformer during Powerlink along with increased speed and weaponry. 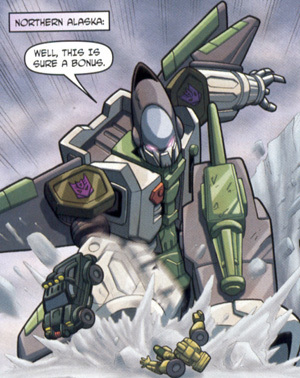 Weaknesses: Subject's arrogance is tolerated only as long as Thrust is in Megatron's good graces. 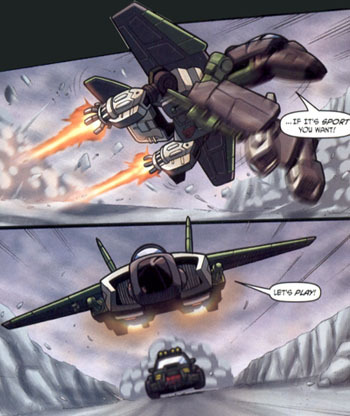 Without Thrust, the other Decepticons would turn on Subject in an instant. 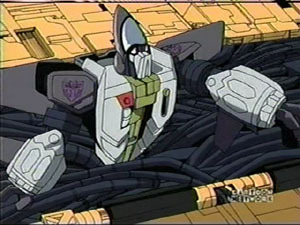 Other Appearances: Several other Inferno characters have appeared in Transformers, however they are all different individuals with the same name as the Mini-Con partner of Thrust.